The basement is often overlooked by many homeowners mostly because of the fact that we don’t get to spend much time in it. However, the importance of having a properly constructed basement nowadays is big. Like any other room, a functional basement gives you enough space for storage – or in some cases, a beautiful and functional living space. This is why your basement needs to be properly framed, insulated and free of any obstructions. 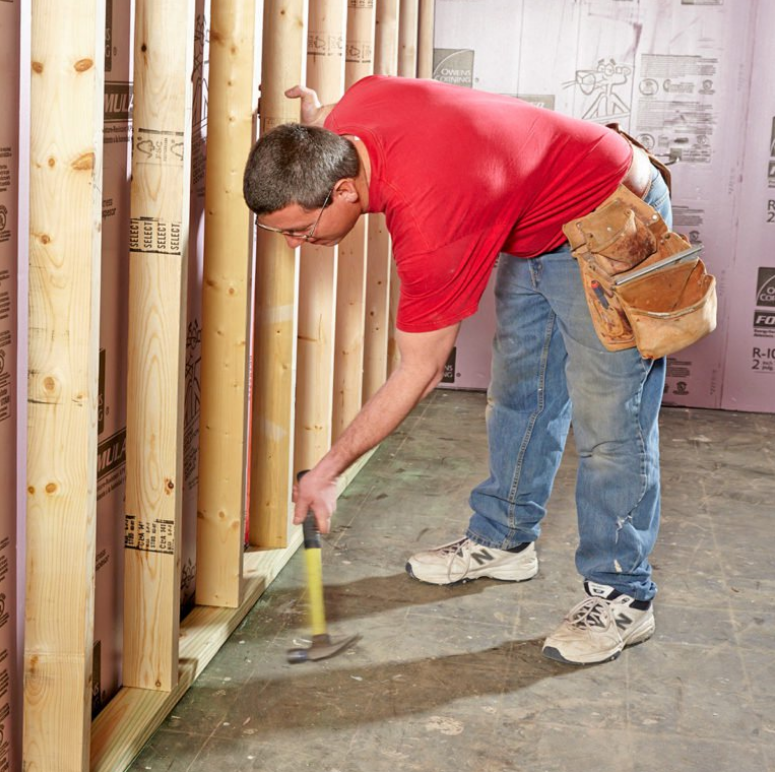 Below, we are listing our full guide to framing a basement. Every basement can be more than just an utility and storage area. And while most of the basements are used in that manner, you can definitely make your basement a room that is as warm, as comfortable and as inviting as any other room in your house. So, let’s get started with all of the steps, showing you how to make the process of framing less of a headache for you. The first step is to design a floor plan. Here, you need to frame your basement walls. 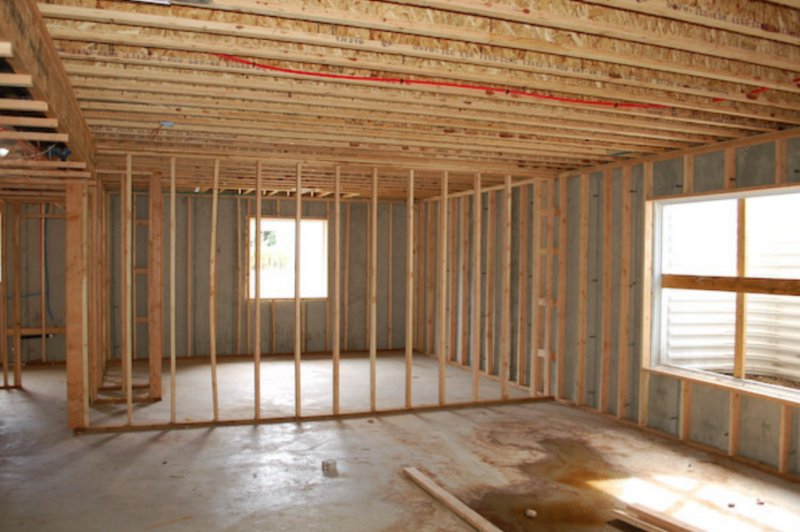 Even though this seems pretty straightforward, a poor framing job can cause a lot of problems for you. You can start by rolling a masonry waterproofing product. This step is crucial because it helps you prevent water that naturally migrates through concrete in a capillary effect. Even though this is not a permanent solution to bulk water infiltration problems, it is a solution that waterproofs your basement against most of the common scenarios. 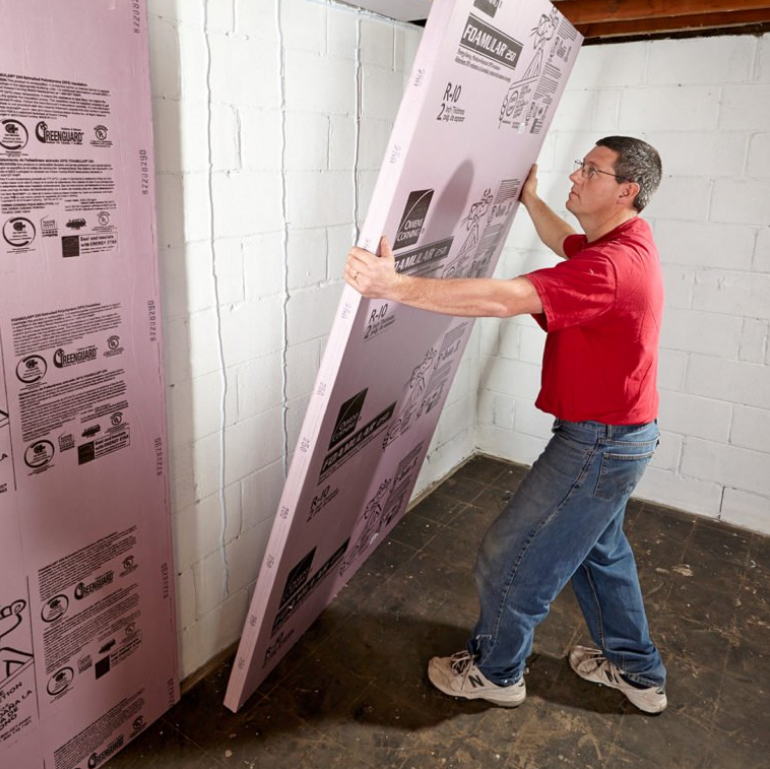 Assuming that your waterproofing has dried, you should install 2-inch extruded polystyrene (XPS) foam board insulation. When doing this, make sure to use XPS as your main type (other types are not that moisture resistant). Stick it to your wall with a construction adhesive which is designed for foam (other adhesives will melt it). Start applying the adhesive in vertical strips in the middle of the wall. If there is water getting behind the foam, make sure to apply adhesive horizontally and therefore allow the water to pool up. Run a continuous bead of adhesive at the top and bottom of the wall (as the most critical points) and tape all the seams. This will prevent warm air from getting outside the room and behind the foam, potentially condensing on the cool concrete walls. 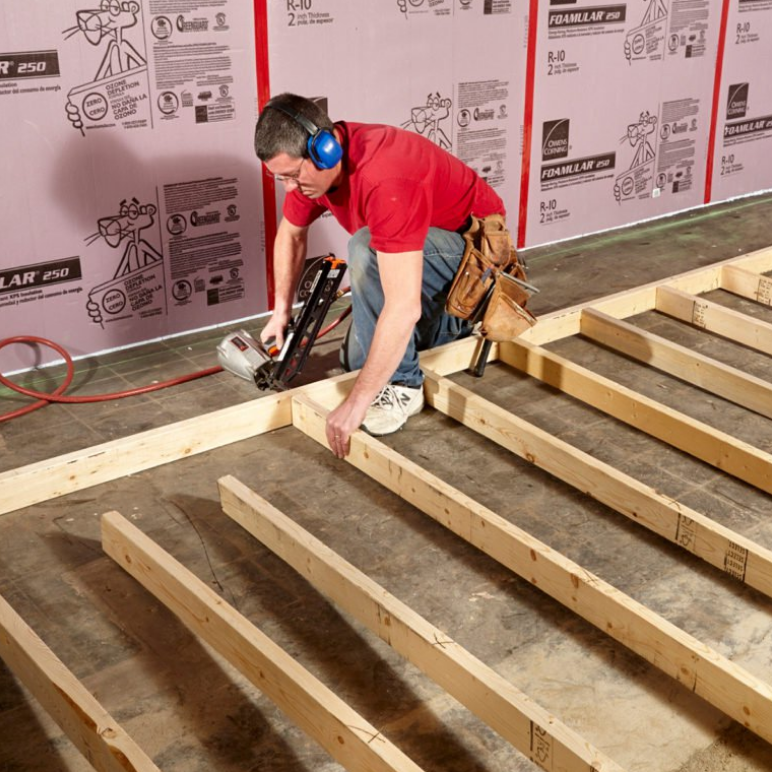 When your floor joists run parallel to the wall that you are building, make sure to install blocking for attaching the top wall plate. You can screw or nail one side of the block through the joist – and secure the other side to the sill plate. If the brace comes in direct contact with bare concrete, use treated lumber. 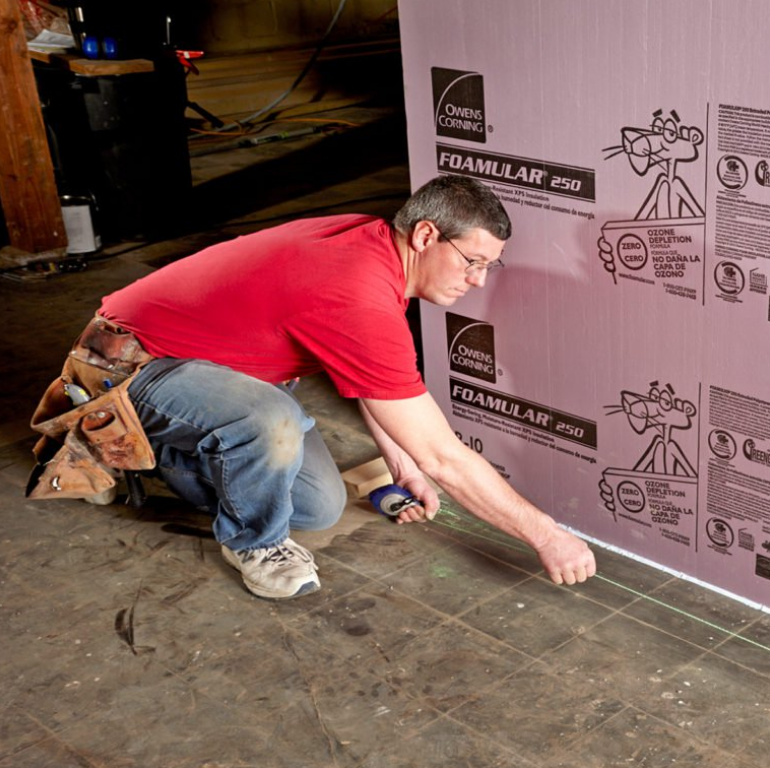 In most of the cases, it is easier to install the braces before installing the foam board on the walls (and insulating the joist). You can place your blocks at 2 feet apart so that they work as drywall backers as well. Snap a line on the floor which is 4 inches away from the foam – as a guide for the bottom plate. 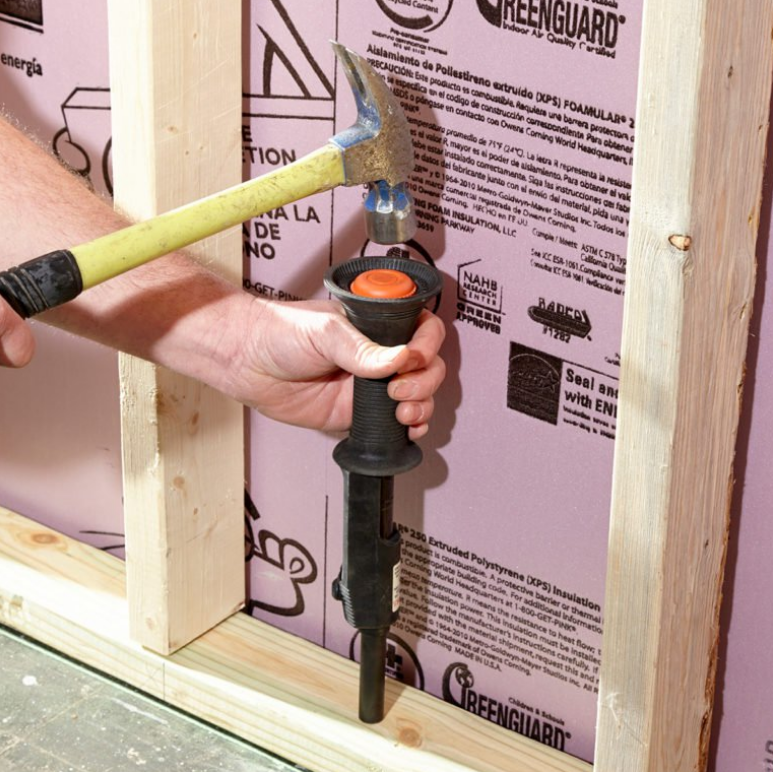 This will leave a gap of ½ inches between your new wall and the foam, allowing a bit of ‘wiggle room’ if the foundation walls are not ruler-plumb or straight. If your basement is big enough, we recommend assembling your wall on the ground. Just make sure to mark every stud as a “crown” and put “X” on it. Make sure your crowns face the same direction (if not, you may end up with a wavy wall). By assembling your wall with the crowns up, both ends of the studs will solidly lie on the ground when you attach the top and bottom plates. Build the wall so it can be tipped up directly. This will also help you easily swing the whole wall up – without any round turns. When it comes to tipping, most homeowners decide to tip walls with the bottom plate against the actual wall. 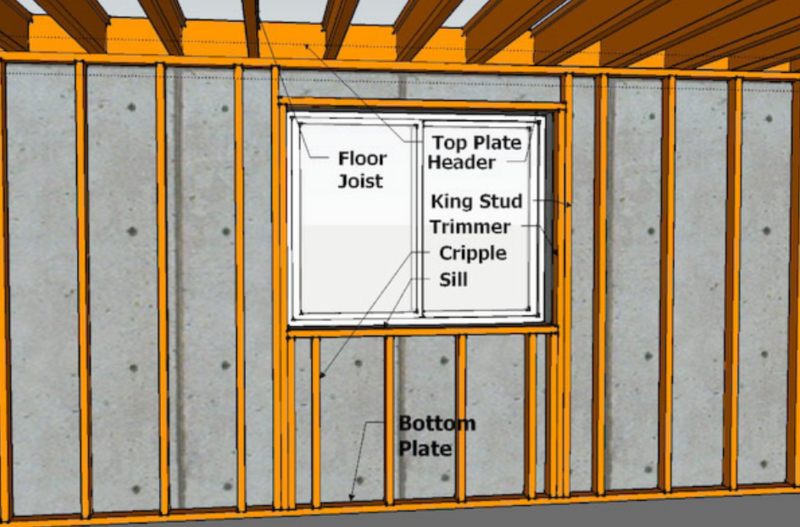 However, if your floor joists are sagging or there is any ductwork in the way – you may have to consider lifting the top of the wall in first and slide the bottom plate in place (as shown on the screenshot below). If you need a sledgehammer to pound the walls inside, they are too tall. The truth is, your top plate doesn’t need to be too tight against the joists – you have shims for that. 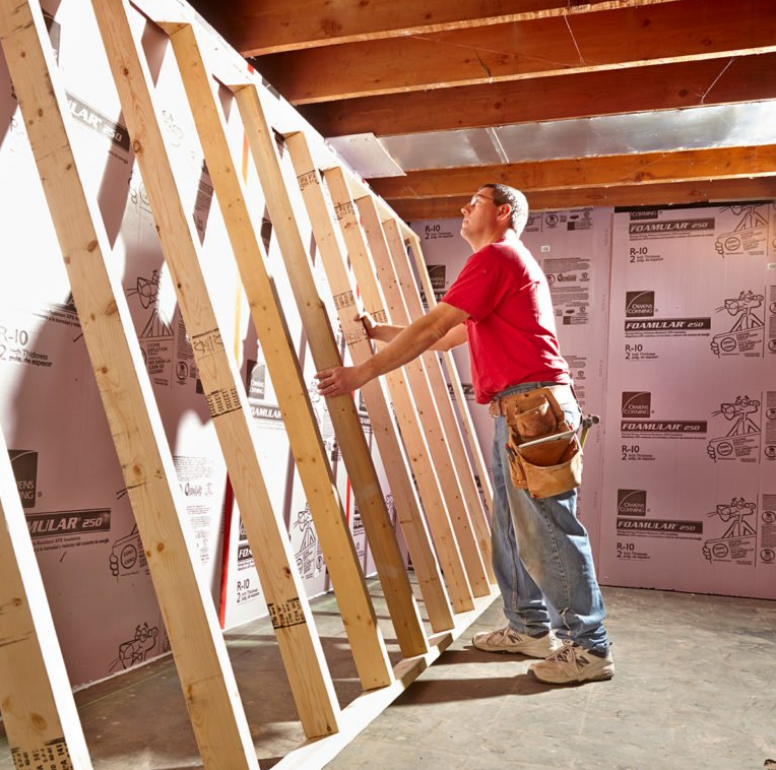 So, make sure to measure the distance from the floor to the joists at several locations and build your wall ¼ inch shorter than the shortest measurement. This way, you won’t raise the joists by forcing your wall. The bottom plate needs to be fastened with a construction adhesive and a powder-actuated tool (PAT). You should place the fasteners at every 6 feet and within 6 inches of each end. We recommend wearing safety glasses and hearing protection during this step – these little things can create a lot of noise. Plumb the wall about every 4 feet by using an adjustable level that reaches from the bottom plate the top one. If your plate level is not a $300 one, you should use at least a 4 feet-level and try to find the straightest studs that will be your guide. The shims are needed at only about every third joist – but nailing the top plate to every joist is a must. 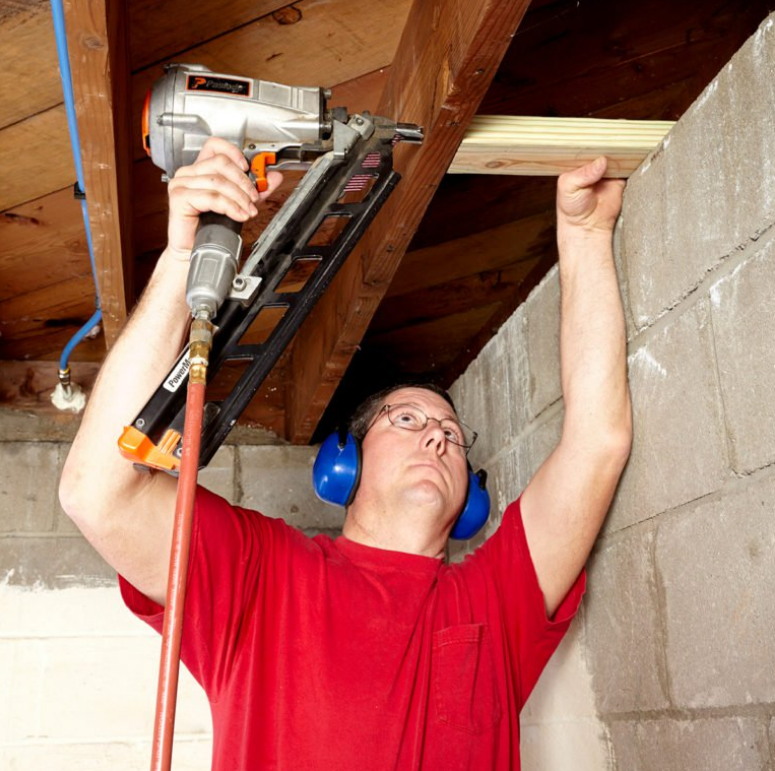 Again, it is not necessary to align the studs directly under the floor joists, but it is a great idea if you plan to run ductwork or plumbing in the walls afterward. If your floor is out of level, the best solution could be to “stick a frame” nailing one stud at a time instead of building the wall on the floor. You can start by fastening the bottom plate and then (by using a straight stud) plumb up to find the location of your top plate. After you snap a line and fasten the top plate, you should plumb up again and mark the location of your first stud on both plates. Use toenails for each stud to put it in place with two nails on one side of the stud and one on the other. Framing inside corners should start with turning the last board on the first wall sideways and overlapping both about halfway past the connecting wall. This way, you can fasten the two walls together and still have a surface for attaching your drywall. 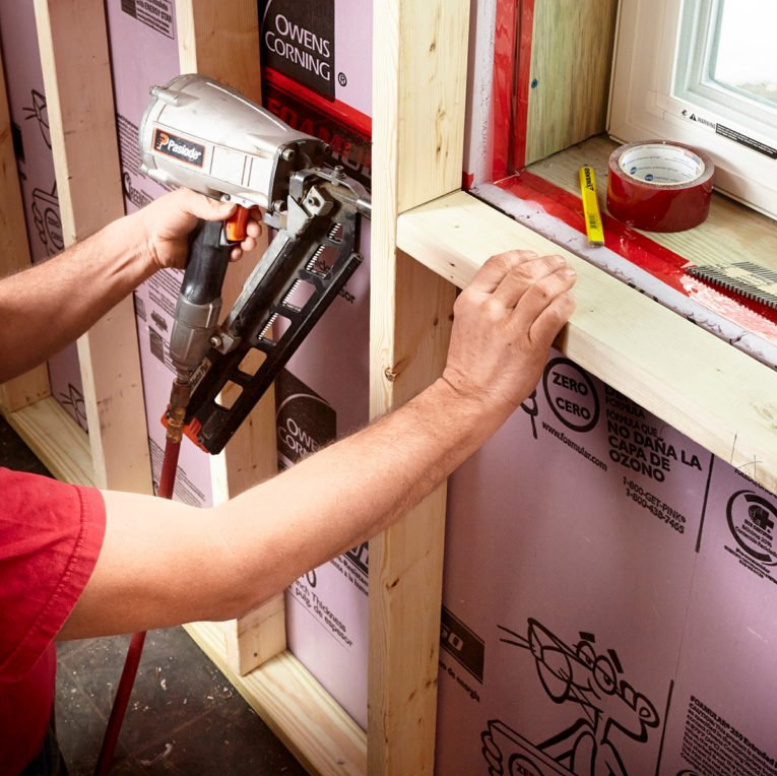 If you are planning windows, they will need wood around in order to be attached to the drywall. 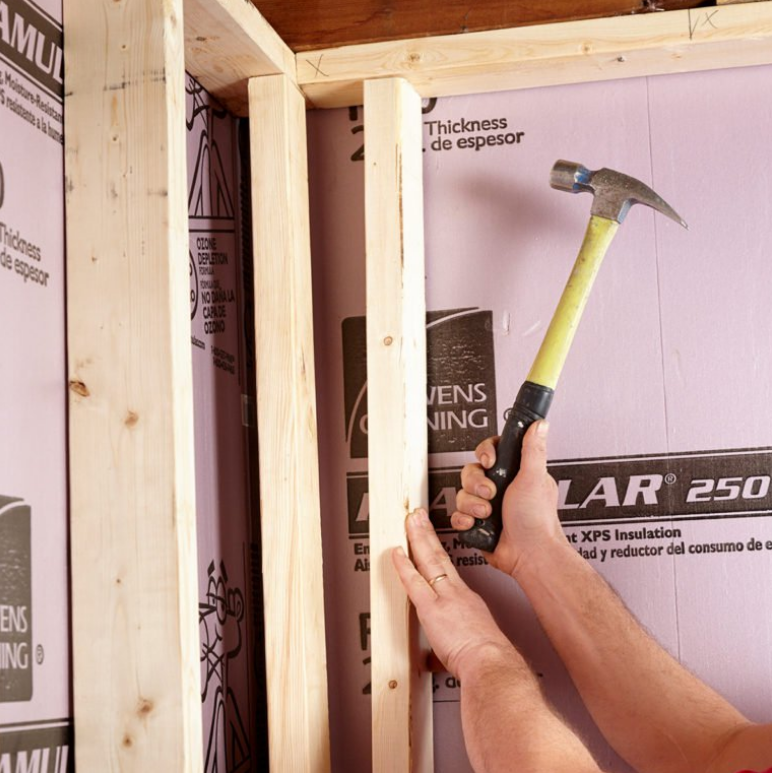 If there is room, you can use foam under the boards and tape the seams to the foam that you have installed on your wall. If there is no room for foam, you can use treated lumber but still tape the seams. To attach these boards, use construction adhesive and concrete. 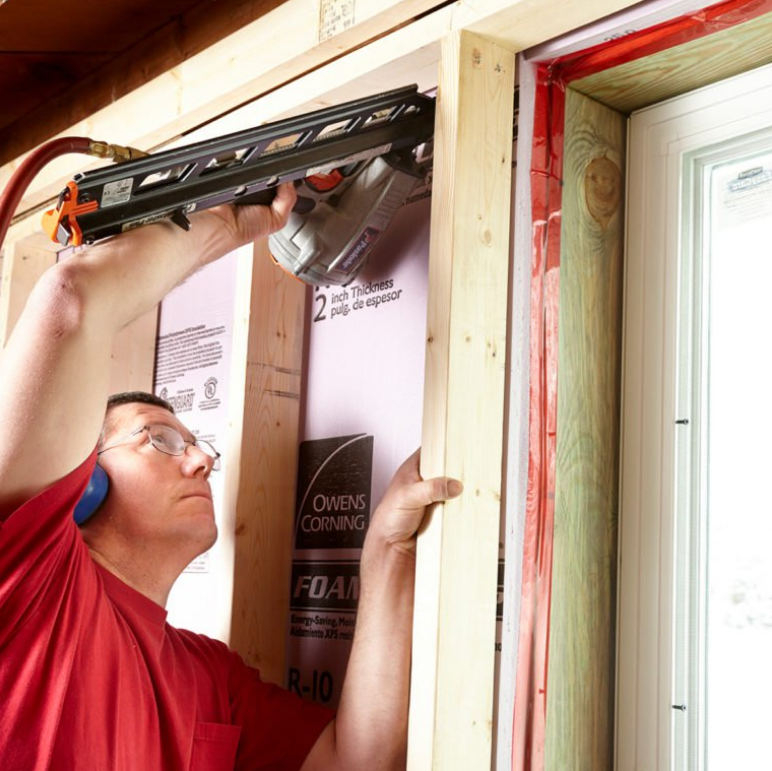 Install the wood around the window before building your wall – it will save time and let you know exactly where the framing needs to be. 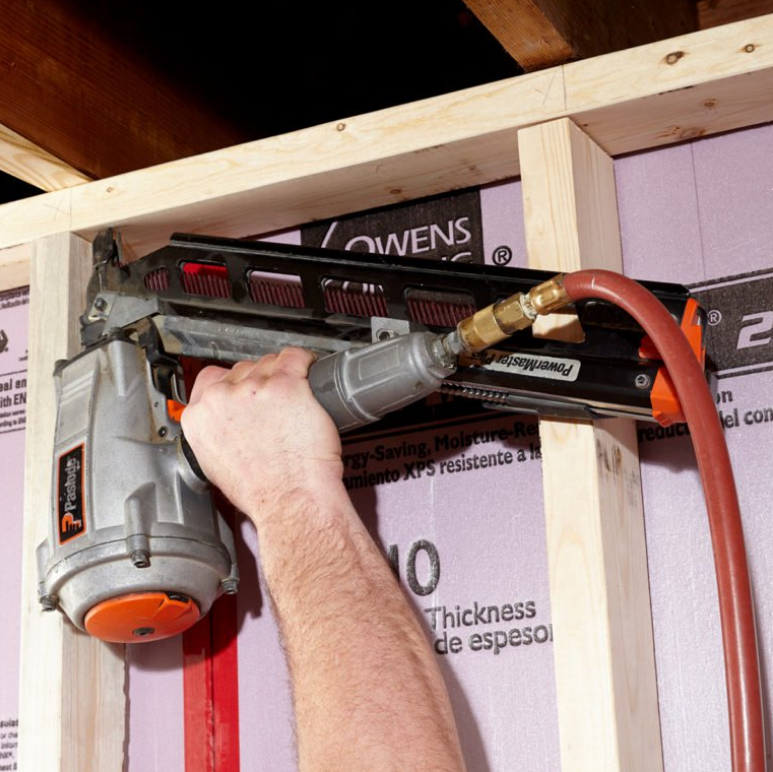 Drywall backers should be added while you have your framing tools at hand – and before you fill the wall cavities. So, it is important to overview the entire area and make sure the ceiling and walls have a sufficient nailing surface for the drywall. 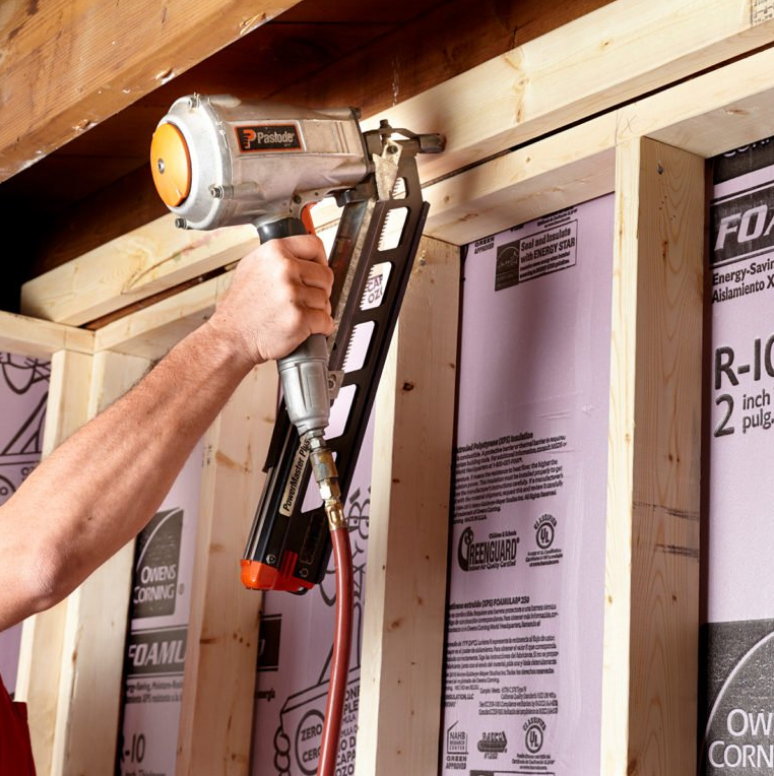 When thinking about using backers, focus on the top of outside corners, perpendicular intersections and the walls that run parallel to the joists – all three being the most common areas when backers are needed. 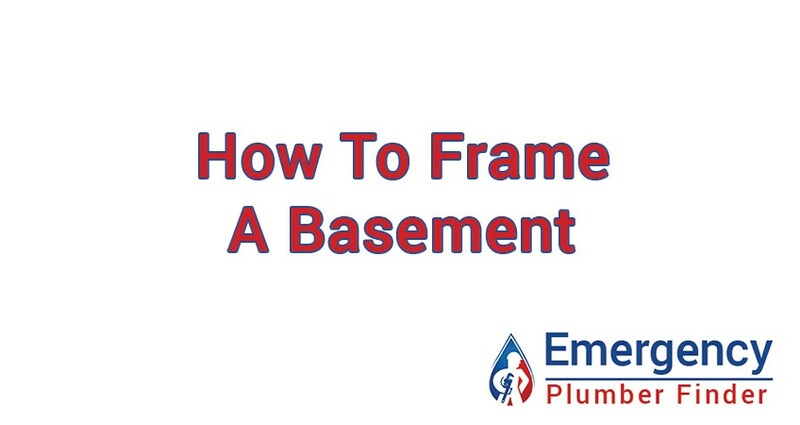 There you go – framing your basement is complete – and has never been any easier! We hope that you will follow these tips and make the most of your basement space. Good luck! We've specialized in providing top-rated plumbing services to local homeowners for over 10 years. Our certified plumbers will make sure to fix your problem on the first visit.